A loud, versatile head that easily swaps from classic rock and blues tones to modern rock and metal. Reliable, road-worthy build quality. Easy to recall settings. Attenuator opens up tonal possibilities at any volume level. Seriously heavy - it could use some grab handles. Expensive. Making its debut at this year's Frankfurt Musikmesse, Orange's new Rockerverb MKIII range builds on its popular two-channel format, adding some significant improvements to the package. 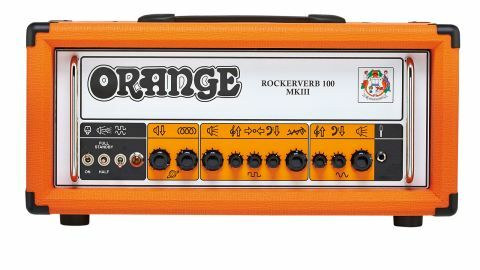 The new range includes this 100-watt head, which is built in traditional Orange fashion with a heavyweight enclosure and enamelled steel control panel, printed with Orange's distinctive graphic symbols. One immediately noticeable change is the front panel, which is 'pics only', like the classic 'graphic' amps of the early 1970s. This means a modicum of thought may be needed to understand the controls if you don't read the manual first. We like the cleaner, text-free look. "Overall, the new Rockerverb range exudes power, reliability and cool"
Under the skin there are more significant changes, including a redesigned 'chimier' clean channel with more headroom, and a reworked valve-powered spring reverb. We also get the same footswitchable attenuator found on the Thunderverb and Dual Dark amps. The amp has a heavy duty steel chassis with welded corners, supporting a pair of huge transformers that make up a significant chunk of the weight. Talking of which, it is seriously heavy: this head weighs more than many combos. Heavy-duty grab handles - as found on the range's combo amps - would be welcome here, too. Inside, the electronics are mostly contained on one large printed circuit board, including the front panel controls and valve bases. A smaller board holds the rear panel sockets. The layout and soldering is well up to Orange's usual high standard and the wiring has been neatly routed and terminated. A very tidy job. The Rockerverb is a proper two-channel design with volume, bass and treble controls for the clean channel; and gain, bass, mid and treble, together with a master volume, for the lead channel. All the knobs have stepped detents with 20 clicks between full on and full off - a neat way to help repeat that great tone from last night's gig, while hopefully preventing the panels from being covered in marker pen or stickers! There are global controls for the valve-powered reverb and footswitchable attenuator next to a bank of toggle switches that handle mains, standby and channel switching. The standby switch selects full or half power with a four-valve/two-valve switch on the rear panel roughly halving these outputs again if needed. A trio of speaker outlets, a pair of send/returns for the fixed level series effects loop and three footswitch jacks complete the rear panel layout. The toggle switches don't have the satisfying, industrial 'clunk' of the old AD series, but still feel very solid and dependable. Overall, the new Rockerverb range exudes power, reliability and cool, boxed up in a unique package that hasn't lost any of its hip visual appeal since being introduced way back in the late 1960s. The head is designed to work with Orange's PPC range of cabinets, although it's quite tolerant of different loudspeaker types. "This is very refined British guitar tone, with a sweet treble, powerful midrange and tight bass that flatters lead lines as well as chords"
While the Rockerverb sounds great with single coils, it comes alive when combined with the throatier punch of a good humbucker. The extra warmth and zing of the clean channel is very noticeable - a real improvement over the slightly sterile clean sounds of earlier models. By using the power switches and attenuator (which incidentally works backwards, turning down the volume as you rotate clockwise), you can dial in a really sweet overdriven edge that time warps straight back to the heady days of the 70s. The lead channel covers a huge spectrum of overdrive, from blues to classic rock and modern metal, with plenty of low-end punch to flatter down-tuned or baritone instruments, and a hint of fuzz that evokes the brand's 1960s origins. This is very refined British guitar tone, with a sweet treble, powerful midrange and tight bass that flatters lead lines as well as chords. It is loud - very loud, in fact - but easily tamed using the power switches and attenuator, blending in real power stage distortion to devastating effect, while the EQ controls on both channels work smoothly and predictably. The stepped detents on all the controls make recalling settings a doddle, and the new reverb circuit sounds impressive with a smooth warm decay and practically no noise. There's no doubt that the extra refinements on the new Rockerverb has been worthwhile: the amp sounds great and should continue to do so for many years. As you might guess from the price and weight, it is aimed primarily at pros and dedicated, muscle-bound amateurs. The weight may well put off casual gigging players who value portability (and their back), but this is a roadworthy rock tool, while the new attenuator makes it easy to create stunning tone at any volume level, too, from very authentic early 70s classic rock on the redesigned clean channel, to modern metal. You're also paying for a UK-made product that's second to none when it comes to build quality and reliability; all in, that represents very good value for money. If you want a commanding, flexible rock amp, but you don't want to spend ages fiddling with presets and parameters, few amps match up to these new Rockerverb MKIIIs.